A new Honda CR-V sounds good, especially when there is a new engine with turbo technology and a five year/unlimited km warranty involved. 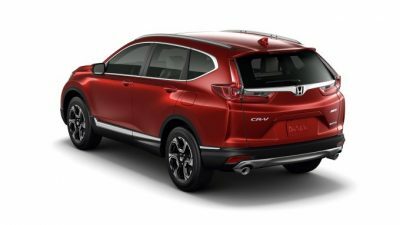 The Honda CR-V has been around for some time now and was one of the first cross-over/SUV type vehicles of its type that came on the market in the early nineties. Back then it was up against the Suzuki Vitara, Land Rover Freelander and Toyota RAV 4 – performing well if a little bland back then. How times have changed, Honda’s new CR-V now has to fend off endless rivals from all corners of the car manufacturing globe. Some of the main competitors to the 2017 Honda CR-V would be the: Subaru Forester, Jeep Renegade, Toyota RAV 4, Kia Sportage, Mazda CX-5, Nissan X-Trail and Hyundai Tucson. 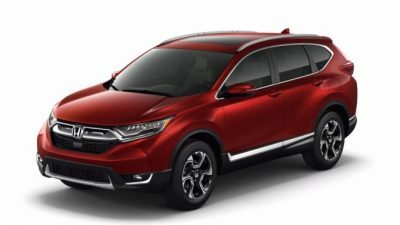 The IIHS has Honda’s hot-selling new CR-V sitting amongst the safest crossovers on the market – especially when equipped with all the safety kit that Honda provides. That’s quite an achievement as Volvo, Peugeot and Audi and BMW are all solid SUVs. All 2017 CR-Vs crash test well, the IIHS says. When tested, the Honda CR-V performed really well in all tests, showing little overlap in front and side impact tests. Roof strength is also really good, and there are some excellent head restraints. New 2017/2018 Honda CR-Vs can also effectively stop on their own if they sense an impending accident. Honda has high-tech Honda Sensing which incorporates a suite of collision-preventing safety technology like automatic emergency braking, adaptive cruise control, and lane departure warning systems. The top of the range CR-V also boasts superb LED headlights. Other features like Hill Start Assist, vehicle stability control and a tyre pressure monitoring system work toward keeping you safely travelling in the right direction. A fresh flavour of design both on the inside as well as the outside of the new car ensures the Honda CR-V keeps itself interesting, attractive and up-to-date. As with any Honda vehicle, the moment you climb inside, the driver’s seat and steering wheel have perfect adjustment for getting yourself nicely positioned behind the wheel. The seats are comfortable and very well crafted, while all the switchgear is easy-to-use and ergonomically first-rate. Room in the rear is excellent for second rowers, though it’s a little tight in the third row when seven seater models are chosen. Still, you get seven seats instead of five! Honda has kept the attractive flowing lines of the previous two CR-V models. This means the roofline still looks curvaceous and aerodynamic, and the high waistline remains. The 2017 CR-V shows a new face, with distinctively designed daytime running lights and LED headlights leading the charge. An aerodynamic bonnet, flared wheel arches and an integrated dual exhaust system makes a great stylistic impression. Silver-finished roof rails and a shark fin antennae enhance the new look, while at the rear is some creative tail light LED lighting design. New alloy wheel patterns finish off what is a well thought out five and seven seater SUV design from Honda. A panoramic sunroof offers beautiful fresh and natural interior lighting – boosting the adventurous appeal that the CR-V provides, especially in AWD guise. AWD models ride considerably higher than the 2WD alternative to handle those light off-road excursions. Flawless build quality does reveal itself in the way the Honda’s interior is impeccably put together and in the way the outside panels fit really neatly. 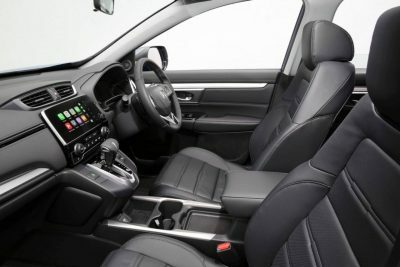 New CR-V interiors offer the buyer plenty of luxury, modern technology and pollen filtered air. Climate controlled air-conditioning is a welcome sight for any vehicle in Australia. The unit that Honda uses in the latest CR-V works quietly and effectively -quickly cooling the cabin on a stinking hot Australian summer’s day. You’ll find the Sat Nav is a great companion, displayed through the multi-function 7-inch touch screen situated in the centre of the dash. For those with musically tuned ears, the new Honda CR-V audio systems are superb, providing some of the best surround sound you’ll enjoy anywhere. Android Auto with voice search, Apple Car Play, Bluetooth audio streaming, Digital radio, HDMI connectivity and USB connectivity are all features on the latest CR-V.
Running away from the competitors is a whole lot easier with the new 1.5-litre VTEC petrol Turbo engine that produces up to 140 kW of power and 240Nm of torque across a wide engine-revolution band. Power is much more prominent and flexible at any speed, making the CR-V a capable SUV that performs well. The maximum surge of grunty torque flows seamlessly between 2000 and 5000 rpm. Both 2WD or AWD models are available, so for those of you who like to explore secondary roads and tracks the AWD capability will be welcomed. On the road, and underway, the new Honda CR-V feels very securely planted and nicely balanced. Crisp engine response makes the latest CR-V the most entertaining CR-V to date, while the new CVT transmission makes the drive very smooth. Honda recommends the 1.5 Turbo has a 12 month/10,000km service interval or when the service light shows on the dash. Fuel efficiency isn’t always an easy fit for a roomy SUV, but efficiency is part of Honda’s DNA. You should be able to get around 8 litres/ 100 km on average, with more frugal figures rewarding those with lighter right feet. If you’re driving the open road lots, then the fuel economy is quite impressive for a petrol-fed motor. I would love to see a diesel or hybrid CR-V becoming available; however that’s not taking anything away from the talented 1.5-litre turbo power plant. Having the paddle shifters on the steering wheel does allow the driver some flexibility when it comes to the driving experience. Modulated chassis dynamics, ESC and active cruise control really does make for a nice set-up. Ride comfort is good whether you are travelling over bumpy city streets or punching though country road corners -definitely a satisfying drive. Big disc brakes bite hard when emergency stops are required, and the ABS backs the CR-V’s good stopping ability. Honda has done so well in providing us with another very good, very functional and very safe family-size SUV. This should be on your radar if you’re on the lookout for a very good roomy and safe SUV. For any more information on the latest Honda CR-V or, for that matter, any other new car, contact one of our friendly consultants on 1300 303 181. If you’d like some fleet discount pricing (yes even for private buyers! ), we can submit vehicle quote requests out to our national network of Honda dealers and come back with pricing within 24 hours. Private Fleet – car buying made easy!